I want to like Eli Roth, I really do. Dude adores horror, and listening to him talk, his enthusiasm is infectious. I love that he champions the genre, but I can’t stand his movies. So when I heard he was remaking Death Wish with Bruce Willis, I cringed. Well, the first trailer is here, and it’s exactly what I expected. 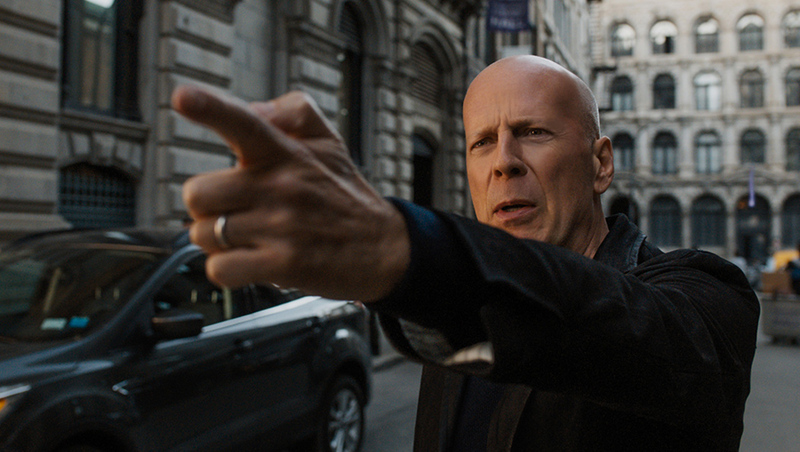 At best, Death Wish looks like a generic, DTV Bruce Willis vehichle of the ilk he’s been churning out on the regular these days, complete with Bruno’s trademark cocky bravado. (And seriously, a few shots look like leftovers from Unbreakable.) At worst, it looks horrifically offensive. Apparently, they took a gander at 2017 and decided, you know what the world really needs? A movie about a white vigilante killing black people. That’s going to go over well. But to be honest, this is Bruce Willis and Eli Roth, neither known as bastions of cultural sensitivity, so this trailer is exactly what I anticipated. It is about a formerly peaceful surgeon who becomes a stone, vengeance-minded killer after thugs attack his family. The inherent anti-PC streak falls right in line with whatever the hell point Roth was trying to make in The Green Inferno. I’m curious if it’s even going to be offensive (I’m sure he’s counting on that) or it if it’s going to try so hard, so obviously to push buttons that it ends up as bland pap. And is Willis really flirting with a hot girl right after his wife has been murdered and his daughter raped? And am I the only one who thinks she looks like the daughter and is roughly the same age? Joe Carnahan (The Grey, The A-Team) originally re-adapted Brian Garfield’s novel and was on board to direct, but departed due to the ubiquitous “creative differences” with MGM. Then Big Bad Wolves directors Aharon Keshales and Navot Papushado were set to take the big chair, which I was way, way down with. Ultimately, Roth came on board, rewrote the script, and cites David Cronenberg’s Eastern Promises and A History of Violence (as well as Sicario, Unforgiven, and others) as inspirations for the tension and violence he hopes to inflict. Lofty goals, we’ll have to see if he can pull it off. Nothing he’s done thus far in his career indicates that he’ll be able to, but what the hell, I’ll give the guy the benefit of the doubt. 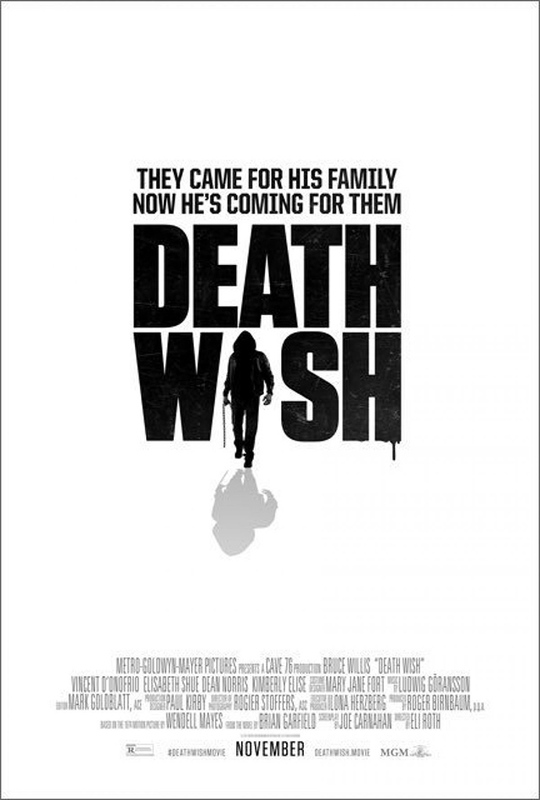 Death Wish also stars Elizabeth Shue, Vincent D’Onofrio, Dean Norris, and Camila Morrone, and looks to continue my confused love of both Bruce Willis and Death Wish on November 22. Check out a spare, ‘70s throwback style poster below.